Valentine’s Day has different meanings to different people. While some couples relish this excuse to secure a babysitter and indulge in fine dining or other adult pursuits, others couldn’t imagine spending the day without their littlest loves. After all, what could be a better teaching experience? When we show our children love, we show them how to love others. There is no better gift than your time, so consider these unique ways for families to celebrate Valentine’s Day in NYC and the East End. Beginning in January, Shine began hosting a monthly workshop at CMEE based on our summer camp in the Hamptons material. Our two-hour program features a theme that brings together art, culture, crafts, community, and fun. This month’s theme is the Lunar New Year. Special guests, local artists, and artisans drop for an unforgettable adventure. The cost is $75 per child, which includes all materials. Sibling discounts are available. To register, call 212-414-5427 or email info@shinenyc.net. (If you miss us this month, try our next Second Saturday workshop on March 9th!) Also happening at the museum this weekend is “Paint by Number,” where toddlers and youngsters are invited to paint a lobby window mural. As always, you can enjoy all the imaginative exhibits at CMEE, including seafaring ships, windmills, sand puppets, food trucks, mini golf, and a kid-sized Main Street. What better way to celebrate love and the idea of finding a perfect match than with “Cinderella,” a timeless story which dates back to 1697? Director Nicolas Coppola brings this classic fairy tale to life with wooden puppets, artistic painted scenery from 18th century France, and the music of Jules Massenet. Admission is $10 for children and $11 for adults. Advance reservations are recommended by calling 718-965-3391 or emailing puppetworks@twcmetrobiz.com. Hershey’s Chocolate World – Plan your own visit! Hershey’s Chocolate World just tripled their footprint in NYC. Valentine’s Day is the perfect excuse to check out their 7,800 square foot store in the heart of Times Square. Scrumptious s’mores are doled out from a vintage camper, which fits in line with their overall vibe: “Unwrap your adventure.” You can mix and match your favorite Hershey products with a floor-to-ceiling candy machine, sure to boggle the mind of children and adults alike. You can personalize a Hershey’s Milk Chocolate Bar wrapper or Hershey Kiss message for your little love, order custom s’mores, or shop the Kitchens Bakery. Dylan’s Candy Bar – Plan your own visit! Dylan’s Candy Bar is another iconic sweet spot in NYC. This shop is a must-stop for celebrity parents like Jessica Alba, Jessica Biel, and Julianne Moore. Inspired by Willy Wonka, you’ll find the world’s largest selection of candy and candy-related gifts here. For a special treat, they’ll be hand-dipping chocolate treats like strawberries, Rice Krispy Treats, and pretzel rods before your eyes. You’re invited to dip and decorate your own take-home confections. Max Brenner’s – Plan your own visit! You simply won’t find a better cocoa than Max Brenner’s “Hug in a Mug.” Your liquid heaven comes in an ergonomic mug that’s perfect for little hands. Their breakfast crepes and sugar waffles provide a warm-and-fuzzy way to start your day. Kids love the “chocolate syringe” that injects chocolatey goodness directly into their mouths. The restaurant can be very busy at times, so be sure to make advance reservations on Open Table or by calling 646-467-8803. We love our partnerships with Tastebuds Kitchen! Their cooking classes are the perfect way to get children interested in baking and the culinary arts. With this seasonal favorite, you’ll create your own “Love Shack” out of gingerbread with pink frosty roofs, heart-shaped window panes, and countless other accoutrements. Enjoy a mug of pink hot cocoa and the sounds of cheerful love songs. The cost is $75 per child, with one caregiver included. Gurney’s Montauk resorts has opened a new winter installation, perfect for the whole family! Even if you’re not staying the night, you can book time in their outdoor heated igloos made from PVC and twinkle lights. Inside, you’ll find a curated selection of games and puzzles. “Order in” from the Gurney’s Little Bites menu of chicken tenders, hot dogs, and other kid favorites for $9. Book complimentary storytelling from 7:00 to 8:00 pm on Friday and Saturday nights. When you’re done chilling, head outside and warm up around the toasty fire pit. Call 631-668-2345 to book. Listen to a reading of Mark Sperring’s “The Shape of My Heart” and take home a book-inspired craft. Make a “Love Monster” puppet. 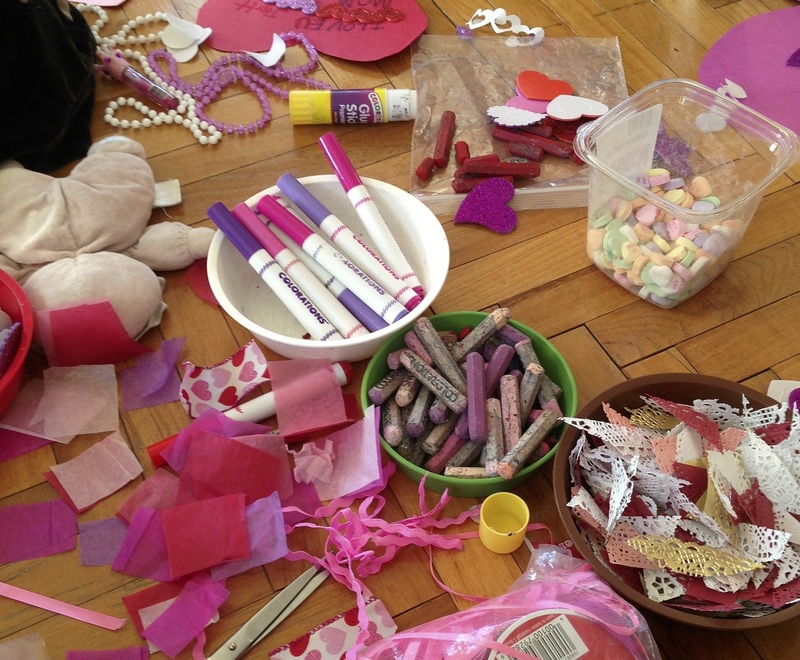 Valentine’s Day crafts are included with $14 admission. Your kids will enjoy all the usual exhibits – song-making, giant bubbles, percussion instruments, climbing sculptures, a a toddler-sized town, tools, the animal diner, building blocks, and the Sandy Island beach station. Whether it’s reading, crafting, baking, sweets, science, the arts, or roughing it in the great outdoors – open a window into your life, inviting your little love(s) to share your passions with you to make this Valentine’s Day truly special.